We all spend a considerable amount of time in the bathroom. Whether you’re showering after a long day or getting ready for the morning ahead, it’s important to feel comfortable in your bathroom space—something that’s difficult to achieve if your bathroom feels outdated. Wholesale Cabinets Inc. is a bathroom and kitchen remodeling business based in Florida, NY, that wants all local homeowners to get the most out of each of their rooms. They offer products like custom cabinets, bathroom vanities, and porcelain tile to help customers design the bathrooms of their dreams. Install Custom Cabinets: A clean bathroom is a happy bathroom. Add a few custom cabinets to your bathroom space to keep clutter to a minimum while simultaneously giving a much-needed boost to your interior design. Wholesale Cabinets Inc. offers a wide selection of RTA cabinets, or ready-to-install cabinets, that make the remodeling process easy. Their products are available in a variety of colors, finishes, and styles, so you can makeover your bathroom however you’d like. Swap Out Old Fixtures: Nothing dates a bathroom faster than its fixtures. Replacing plumbing fixtures like toilets and bathtubs can do wonders for the feel and overall aesthetic of a room. However, they’re not the only fixtures to consider. Switching out your old faucets, hardware, and even lighting can quickly make your bathroom more stylish. Replace Outdated Tile: Nobody wants decades-old tile lining their bathroom—especially if it’s cracked or falling off. Install new tiles to reflect your tastes and the current year. Wholesale Cabinets Inc. offers a wide range of tile materials, including ceramic, porcelain, and stone, that can give your bathroom a more attractive and contemporary design. Update your bathroom today with the appropriate replacements and additions. 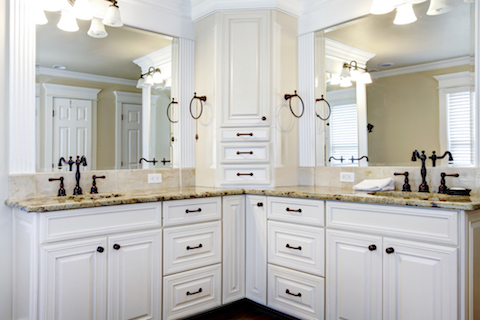 Wholesale Cabinets Inc. is eager to help local customers remodel their bathroom spaces with their selection of custom cabinets and tile, as well as their cabinet installation service. Call them at (845) 508-6577 for a quote, and visit their website for more information about their available products.